In another exclusive with Rewarding Times, we have teamed up with Beef & Lobster Temple Bar, D2. Dublin’s best steakhouse by Michelin-starred chef Oliver Dunne; Beef & Lobster is now OPEN in 2 locations: Temple Bar and Malahide. 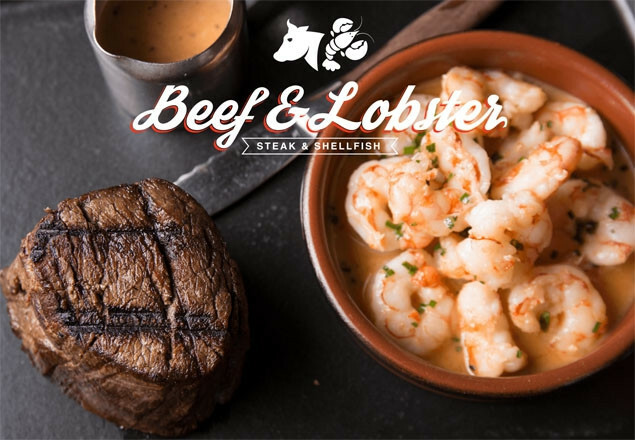 With this fantastic exclusive offer; each diner will savour Beef & Lobster’s mouth-watering Surf 'n' Turf each consisting of an ‘8oz Fillet and 5oz of King Prawns in Garlic Butter’ with two sides and 2 delicious desserts to finish! Beef & Lobster brings together The Best Of Land and The Best Of Sea! They serve 100% grass-fed Irish Beef that is highly marbled to ensure the juiciest, most flavoursome steak possible. The Best Of Sea offering includes fresh Irish lobsters from the West Coast of Ireland and fresh Irish crab caught off Lambay Island. You can enjoy the food washed down with great beer, wide selection of wine and refreshing cocktails surrounded by good people and good energy. All this nailed by the best chefs, with a price tag that delivers real value for your hard-earned cash. What’s not to like?! Voucher is redeemable in Beef & Lobster Temple Bar only. With this offer; each diner will savour Beef & Lobster’s Surf 'n' Turf each consisting of an ‘8oz Fillet and 5oz of King Prawns in Garlic Butter’ with two sides (one per person) and 2 delicious desserts. Vouchers can be used Sunday to Thursday in Beef & Lobster Temple Bar. The offer is not available on Friday and Saturday. Voucher is valid until Thursday November 8th 2018. The redemption date of the 8th of November is firm. No correspondence will be entered into regarding late redemption of your Rewarding Times Voucher. Please quote Rewarding Times and the Voucher Code when booking via email. In the event that there are no available tables on the evening of your choice, you will not be guaranteed a table by using the voucher. This voucher cannot be used in conjunction with any other special offer or promotion. Any overspend on the day must be paid directly to Beef & Lobster Temple Bar. Multiple vouchers may be purchased however please note one voucher per table will be accepted.